It seems to be on for a month, then back on again, repeatedly, but a worth while reminder OP. Thanks. It's pretty much a regular deal in … It's pretty much a regular deal in Tesco:http://www.hotukdeals.com/deals/any-4-for-1-00-tesco-instore-online-1347149http://www.hotukdeals.com/deals/east-end-chick-peas-chopped-tomatoes-peeled-plum-tomatoes-400g-x-4-1-00-tesco-1320729It seems to be on for a month, then back on again, repeatedly, but a worth while reminder OP. Thanks. 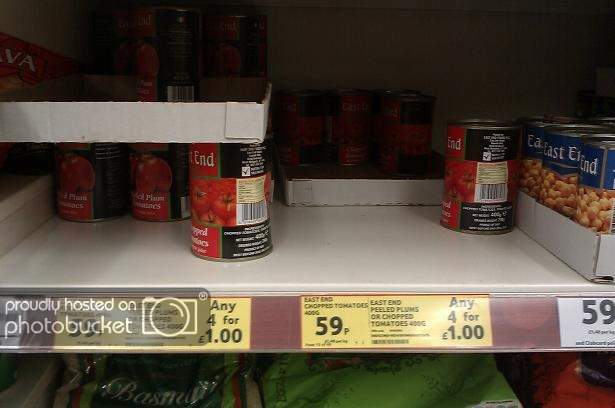 Think the offer of 4 Heinz tomatoe for a £1 would be better. Never heard of this brand, " I might be wrong though "
They are alright for a curry but if you want to make pasta then better off with a more expensive brand. 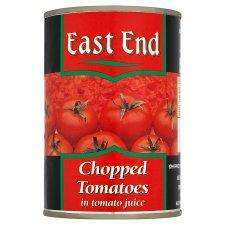 do they chop tomatoes differently in the East End to the rest of the country? I find these tomatoes to be fine, much better than Tesco Value ones. I still have 12 cans to get through tho, so might be passing on this one...although you can never have too many tinned tomatoes! do they chop tomatoes differently in the East End to the rest of the … do they chop tomatoes differently in the East End to the rest of the country? Yes they use spoons instead of knives to chop these. This then bruises the tomato to release more flavor. These are great, next to no skin unlike some of the cheaper brands. Great price. These are perfect for making curries. I always search out East End stuff in Tesco, especially big spice bags. Much better value than the 'branded' stuff - and it's good gear too, perfect for many , many curries.